When it comes to the history of Italian restaurants in Canada, Oreste Pulice must be counted among the pioneers. In 1954, at the age of 19, Oreste arrived in Canada with a suitcase and a dream...Young and ambitious, he went to work as a waiter at Montreal’s heralded Moishe’s Restaurant, where his brother-in-law was a chef. Oreste's enthusiasm and hard work paid off. Before long, he was earning as much as $600 a week-a huge sum in those days. Finally, in 1968, after years of planning and saving, Oreste's dream became a reality: he and his brother-in-law opened their own restaurant. They named it PLACE TEVERE, after a famous river in Rome. “Those early days were very tough," Oreste recalls, "We had only 20 seats and two delivery men. Some weeks we'd earn no more than a $100. When cash was short, we’d pay our delivery men with free meals!” But with quality, value and service, PLACE TEVERE soon became a dining destination. As the popularity of their products grew, PLACE TEVERE embarked on a franchising expansion program. Today, the founding families continues to keep close watch on the ever-growing TEVERE network, with the majority of franchises operating as high-volume counters in shopping malls in the provinces of Quebec, Ontario and Alberta. And the key, as history has shown, remains superior food at affordable prices. Lastly, they would like to thank all of their employees and franchisees for their hard work and dedication and especially you, customers, for your continuing support in making them the leader in the Italian food sector. 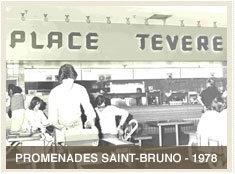 1968: Oreste Pulice and his brother-in-law open the first PLACE TEVERE in St-Genevieve on Montreal’s west island. 1971: a second full service PLACE TEVERE opens in Dorval,run by Paul Reda and Vince Pulice. 1974: the first PLACE TEVERE counter opens in Lavals Carrefour shopping center under the care and management of Joe Reda. The first restaurant to sell pizza by the slice. 1988: with the direction of Raphael Pulice and Frank Reda the first PLACE TEVERE franchise is born in place Montreal trust. 1990: a central kitchen and distribution center is formed in St-Leonard, Quebec operated by Frank Pulice and Johnny Reda to manufacture and distribute the chains sauces and other exclusive products to all PLACE TEVERE restaurants.